There's been a lot of contention in comments over the past few weeks about just how much (or how little) character development there should have been in the opening three hours of this miniseries. I've generally been OK with the way our three main characters - one of whom we still barely know - have been developed. We first get to see two of them in wartime, then we get to see two of them on leave. Only Sledge is left behind on the homefront so people can ponderously tell him just what we're supposed to be looking for thematically from this work as a whole. But the more I think about how the show has slowly filled in Leckie and Basilone, starting from the edges, then working in toward their cores, the more I think that the character development on the show has been developing a different main character entirely, one that most of us have missed. Fittingly, that character is the one in the title. The main character of The Pacific is, well, the Pacific, both as a theater of military operations and as a geographical feature of the Earth. This is a series about men pushed to their limits, sure, but it's also a series about how little the war or nature itself care about these guys. To the former, they're simply potential dead bodies. To the latter, they're insignificant gnats to be rained on or washed away in the mud. Those first two hours, then, were not there to develop the characters of our main three Marines. Instead, they were there to develop the character of the war and the islands it took place on. In this fashion, once we got to know the Marines a little better (in week three), we'd be filled with even more dread when they touched down on New Britain and Pavuvu. Now, you could make a pretty good argument that this could have been done in reverse, that the series should have foregrounded the development of the three Marines before it sent them into Hell, but I rather like the way this has played out. Now that we understand that the battle itself is not something these men can wholly understand (even as they're subtly adjusting to it almost instantly) and now that we understand the fact that the battle is almost against the jungle itself, it's time for us to find out more about the actual people who are in the middle of this morass. 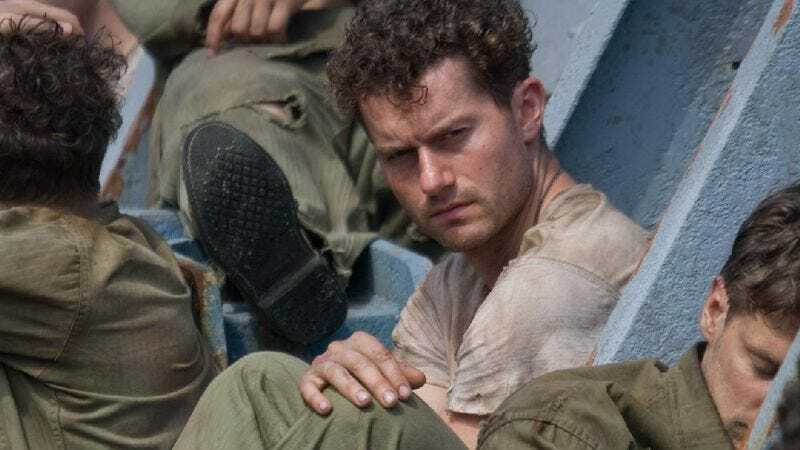 To some degree, Leckie and crew have to start out as generic Marines, as that's the only way to tell the story of the average Marine in the Pacific, stranded on islands they could barely make sense of and stuck in a war that didn't operate under normal rules. "Part Four" also spends a little time better developing the Japanese side of things. As I mentioned back in the review of the first episode of this, Pacific stories are so rarely told because it's harder to understand the enemy and the way they do battle. The differences between cultures are so pronounced that it often requires an entirely different movie to tell these stories in any significant way. The Pacific, so far, hasn't really tried to drop us into the Japanese mindset (probably to its credit), but we're getting a sense of them as something other than a shadowy enemy. They're brave in a way that many would call foolhardy (and, really, the series seems to argue, there isn't a lot of difference between the two, just a thin line that's easy to cross). And when one of the Marines chokes an injured Japanese soldier to death, it's a moment that's horrifying and continues the slow descent into psychological distress many of the Marines - including Leckie - find themselves heading into. The big thrust tonight involves how the war is slowly grinding down the Marines. Lebec shoots himself. Another Marine strangles that Japanese combatant to death. And even Leckie seems to just dissolve, staying on his cot and staring into nothingness before being sent to Banika to recuperate. The Banika scenes are fittingly jarring, particularly how everything there seems to move in slow motion. 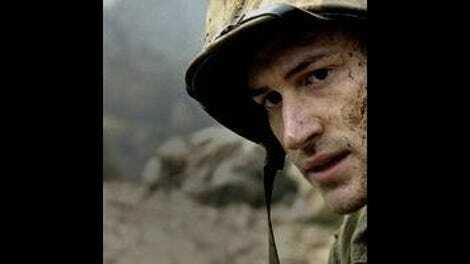 I especially liked seeing Matt Craven turn up as the guy who was deciding if Leckie was OK to return to combat. Craven's a good, calm character actor who's bounced between a lot of projects beneath his talents in the last few years, and it's nice to see him doing something of quality. But if this episode is our first introduction to just how grueling this war was, psychologically, for our soldiers, it's a very good introduction to that idea. The rain here is so omnipresent that it seems to wash down off the screen and get all of us in the audience wet. The whining seems like the only rational response to an environment that doesn't give a damn about what these men are doing or what their ultimate mission is. It's an episode that seeps down and gets under your skin, like that hammering rain, and it provides the best sense yet of just how little these men could be individuals in the face of both war and the very forces of nature itself. The only appearance by Basilone is in a comic book in a very funny scene featuring Nate Corddry as a new character named Loudmouth. The Pacific uses comic relief well, and I liked Loudmouth saying that Basilone was the only one to do anything on Guadalcanal. Sledge turns up just barely, working through his training as a Marine and accidentally hitting two dummies that are to represent U.S. forces with his shell. Got a long way to go, kid. I love the way the series suggests just how much these guys have gotten used to never knowing just where the next battle's going to come from or when it's going to happen. Their constant on-edge behavior is fantastically portrayed. Finally, I know that most of this is probably hearsay, but I love this thread about the Japanese soldiers who continued to fight World War II after it was over, one of my favorite bits of 20th century historical esoterica.